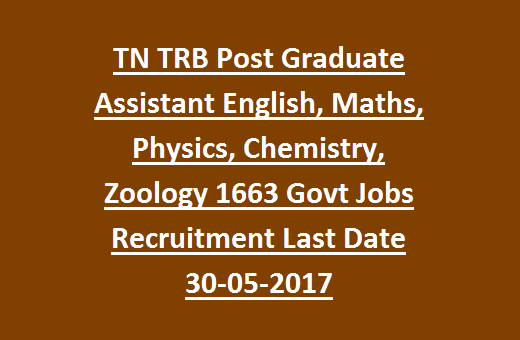 Tamil Nadu TRB Post Graduate Assistant Jobs Recruitment 2017: Teachers Recruitment Board, Tamil Nadu Higher Secondary Educational Service welcomes candidates for Post Graduate Assistant/Physical Education Director posts filled through TRB PGT Exam. Interested/ Eligible candidates may apply online for PG Assistant posts using the Teachers Recruitment Board official link @www.trb.tn.nic.in. Applicants must send their filled applications before last date of 30-05-2017 for this PG Assistant Jobs. Candidates can register online applications from 09-May-2017. Tentative date of Examination for this Post Graduate Assistant Jobs will be on 02/07/2017 and results will be announced in August, 2017. Total aggregate no of vacancies available in Tamil Nadu TRB Recruitment is 1663 posts, which tentative (may change at the time of notification/ before final selection). TN TRB Recruitment of Post Graduate Assistant vacancies will be filled through a competitive examination which will be held on 02/07/2017. 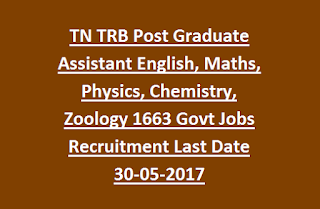 For more details of TN TRB PG Assistant Jobs Recruitment 2017- Educational qualifications, age limits, Pay scale, Vacancies, Exam dates, Syllabus and Application procedure are given below. Starting date for submission of online application forms: 10-May2017. Available vacancies in Tamil Nadu Teachers Recruitment Board (TNB) Recruitment are 2119 posts. Post name: Post Graduate Assistant- 1663 posts. See the TRB Notification for vacancy details. Subject wise vacancy detials are given below. Upper Age limit for PG Assistant post is 57 years as on 01-July-2017. Age relaxations for reserved category will be applicable as per Govt rules. Selected candidates will be paid as per Govt norms, Please see the TRB Notification for other details. Candidate must have qualified Post Graduate Degree along with B.Ed. Candidates applying for Post Graduate Assistant post will be shortlisted based on qualifying examination held by Teachers Recruitment Board, Tamil Nadu. Date of examination will be on 02-07-2017. Download the Admit card/ Hall ticket before the date of examination. Exam Results will be released in August, 2017. Interested candidates are advised to visit Teachers Recruitment Board Tamil Nadu official web portal @ www.trb.tn.nic.in to apply for current recruitment vacancies. The mode application submission is only through online. TN TRB Application Forms available from 10th May, 2017. Please visit TRB website for latest information and other updates. Closing date for submission of online application is 30-05-2017.